While I was far from being the first person to jump onto the smartphone bandwagon, I have to admit that it has quickly become one of my beloved possessions. With so many capabilities, conveniences and ways to stay connected, it is no wonder that we become dependent on having our cell phones with us at all times, right? Which means, of course, that if something were to happen to our little sidekick, it would be that much harder to accept. Unfortunately, according to a study conducted by Asurion, July is the worst month for cell phones, as water, heat and outdoor activity all present dangers and increase the likelihood of damage. Don't want to even imagine the heartbreak you'd feel seeing your phone dropped on the concrete or dunked in the swimming pool? While none of us do, it is fortunate that we can find solace knowing that there are a few different ways to help protect your investment (read: save your money!) in smartphones thanks to RadioShack. First, RadioShack's Mobile Product Support (MPS) is a free service available with any in-store mobile device or tablet purchase. MPS includes free expert support over the lifetime of the device and this 24/7 mobile support is accessible via phone, live online chat at RadioShack.com, email or online forums. Who doesn't appreciate being able to reach help when you need it? Second, RadioShack offers their Trade & Save program for those unfortunate phones that are already beyond repair. This program allows customers to trade in an old mobile device or other retired technology and immediately apply the appraised trade-in value toward a current purchase. Shoppers can appraise their device at RadioShack.com/tradein, and then bring their device to the store to have the appraisal confirmed and complete the trade. What a deal! Finally, RadioShack now carries Werx iPad, iPhone, iPod touch and Android screen replacement kits and I'm already enamored with just how genius these kits are for gadget-loving folks everywhere. While seeing your phone or iPad with a shattered screen is far from a joyful event, these cool new kits allow you to send your device with its cracked touchscreen in to Werx to be fixed. Pretty simple, right? Simply send your phone in the included prepaid FedEx box and, within 72 hours, it will return home directly to you repaired and ready to go. Even better? Included in the repair is a limited lifetime screen replacement warranty stating that if anything goes wrong the screen after it has been replaced (not including accidental damage) the customer will simply need to contact Werx for a for a free replacement. Why did these kits not exist before? Werx Screen Repair kits retail at RadioShack for $99 for the Android and iPhone/iPod touch versions and $199 for the iPad. Compared to monthly insurance, quick-fix shops or completely replacing your device, this is a much more affordable option! Whether you treasure your phone, you have a family member who does, or you simply want to protect your investment, these kits from Werx can make the difference when it comes to saving your wallet (and sanity) when the unfortunate occurs with your smartphone. 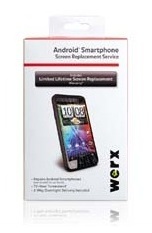 One lucky person will win a Werx Screen Replacement Repair Service kit for Android phones! A big thank you to RadioShack for providing a Werx Repair kit for the iPhone for me as well as a Werx Repair kit for Android phones for one lucky giveaway winner. The opinions shared are my own and honest and if you really need to see more, click here to see how I roll. This would be a gift for my grandson who has an Android phone with a shattered screen! I wish this would have existed a year ago! I broke my phone them and it was awful! I could probably use this in case it happens again! This would be great for me as I break phone alot! OK I have spent a few hundred $$ on these before ... I am so glad to find out about this product!!! !! Anyhoo, I've been on Mars for two months but I am back now - hope your summer is going fabulously! BTW, if you get the chance to stop in and see what I have posted I would love your input - mabye you could even ask your readers ... I know a nuber of them bought my book after you reviewd it and would be interested in their opinions. "Talk" soon! My daughter has been thru a few phones, she drops them & breaks the screens. Everyone in my family has a phone and sooner or later a screen is going to get broken. We have an android phone that my teenage son busted the front glass on. Had it repaired and now it spazzes out all the time without anyone touching it. I would like to try again with this product! I need this for my teenage son , who drops his phone every day. I'm just waiting for the crack. I have an android phone and... Well..... I'm a klutz. My screen is broken and the pieces of glass are falling off. My daughter fell on her android phone and fractured the screen. She still uses it, but this would make it a whole lot nicer. The entire family has smart phones...we all can use. my son had to replace his Android because of screen issue. Life happens and screens are vulnerable. I would love to win this for a coworker.. she just mentioned yesterday that a friend of her daughter's has a cracked screen and was looking to replace it for her.. Her family really can't afford to do it right now... Thanks!! My phone iPhone was dropped and the screen is broken. I could use it on my iPhone. This would be awesome to get, I just got a new android 'cause I broke my other one so this is needed. I am so very hard on my phones lol. I would love to win this. I have a Galaxy S phone with a shattered screen, this would be GREAT! This would come in handy for my friend because he just got a new phone. To protect and replace mine! My son took his android to football pratice last week and somone stepped on his phone, breaking the screen. This would be great for him. Because I have already broke my screen twice! Perfect - we could really use this! this would come in handy for me because i cracked the screen on my phone a couple months ago and i'd really like to fix it. My Brother could use this for his phone appliance! My son. Need I say more? I don't think he's ever owned a phone he hasn't broken. Sigh. I'm always dropping my iPod touch! This would be wonderful for my husband because he is rough on phones. I have both an iPod touch and an Android cell phone. After a trip with the family to Six Flags...the phone gets dropped. Fortunately mine didn't break but my husband's is. He can't see his screen. Between the 2 of us, it'll definitely get used. for my daughter, her iphone, she's always dropping it! My husband and I both own Android phones. I would love to win my brother needs a ohone for his bday,! I drop my anroid phone alot. We all have smart phones in my family and always need this!